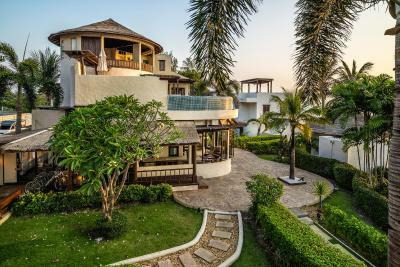 Lock in a great price for Aleenta Resort and Spa, Hua Hin - Pranburi – rated 8.4 by recent guests! Everything was perfect! 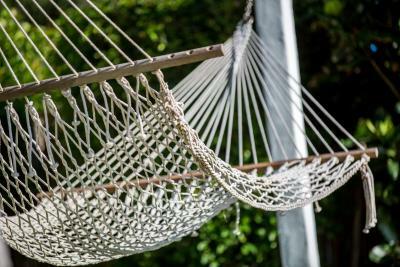 The location is fantastic, a real place to destress ! The staff is very kind and always doing their best to help you in any way possible. The breakfast....or should I call it brunch is stunning ! 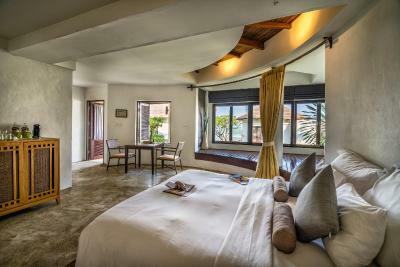 The rooms are spacious, clean and nicely decorated. The quality of the spa treatments is very good and we had een very nice private barbecue on the beach : nice food and a really lovely set-up on the beach! I can recommend this resort. 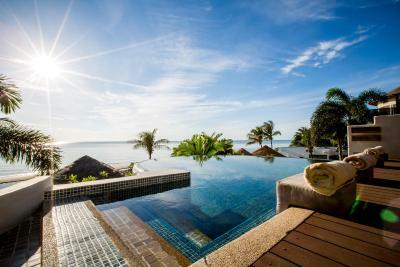 We stayed in the Frangipani residences and the view from our sundeck : swimming pool and the sea is really fantastic ! We had a really wonderful stay ! 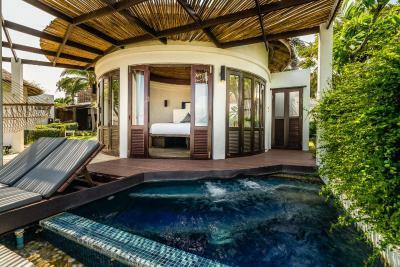 The view from the bed and the Jacuzzi pool is right next to the beach. It is pretty private and peaceful. I spent all 3 days just enjoying the beach view not going anywhere. The breakfast was so great in quality and delicious. It's small and tastfully done. The staff are very gracious and helpful. The rooms at the main wing are stunning. 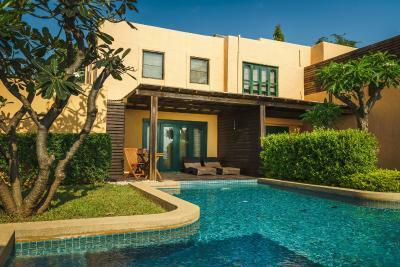 We also had a 4-bed villa which was beautiful and great value for money. Breakfast was an especially nice touch. We made good friends with the pastry chefs! 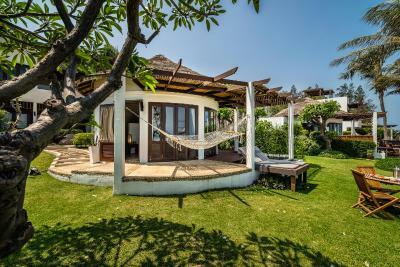 Great location, stunning beachfront villa with jacuzzi and outdoor shower, tasty breakfast with the a la cart egg choice. Close to the national park and caves. Returning customers. place os awesome, beach front and verry private. 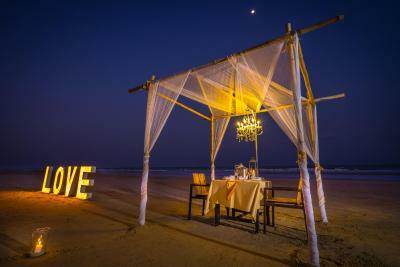 perfect for couples, honeymooners. be prepared to do nothing and enjoy the beach. 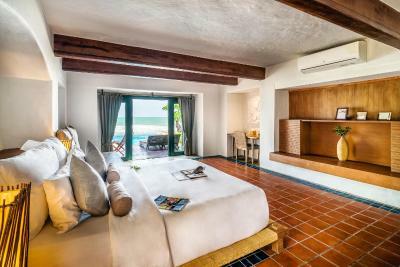 The room facing the beach is magnificent. It's awesome just to wake up and see the amazing view. 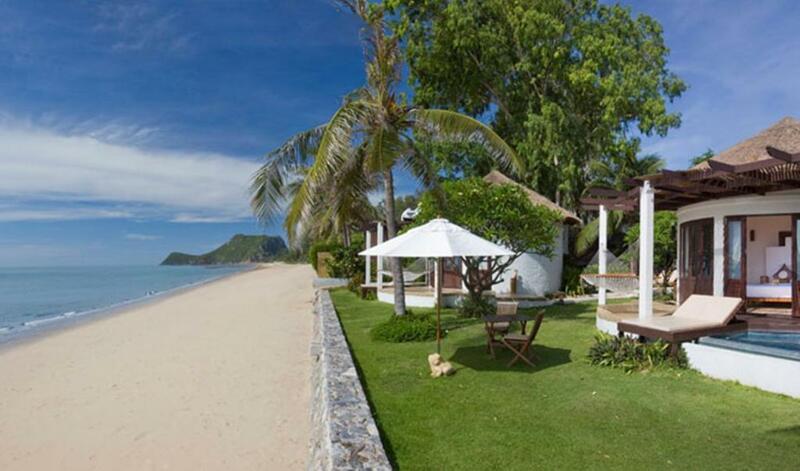 Nice beach, great breakfast, quite location and seclude! 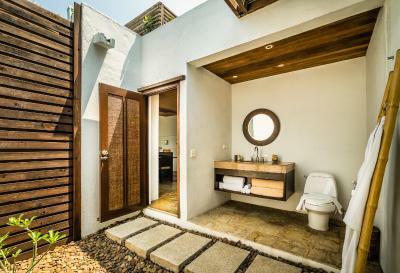 Aleenta Resort and Spa, Hua Hin - Pranburi This rating is a reflection of how the property compares to the industry standard when it comes to price, facilities and services available. It's based on a self-evaluation by the property. Use this rating to help choose your stay! One of our best sellers in Pran Buri! 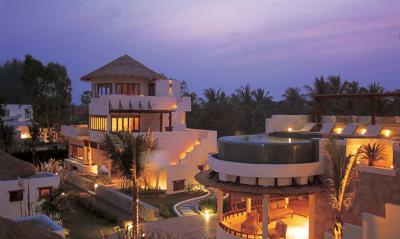 Featuring 5-star Mediterranean-style accommodations, Aleenta Resort and Spa is situated on exclusive Paknampran Bay. 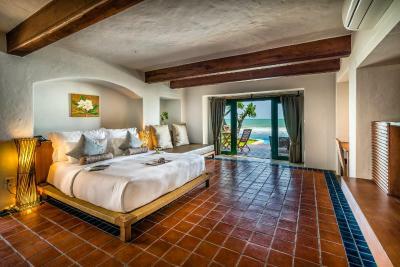 It features an infinity pool, free Wi-Fi and free private parking. Free bike rental is available. 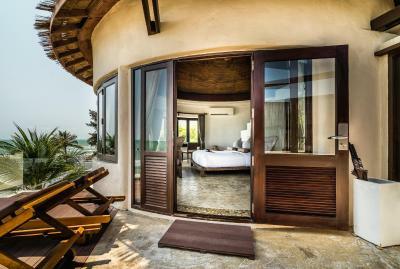 Open-concept suites at Hua Hin Aleenta are individually designed and feature private decks and wooden furnishings. They are equipped with iPod docking stations and a safe. 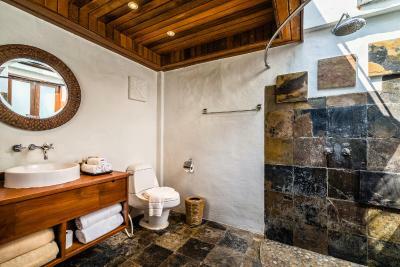 Spacious private bathrooms have toiletries and rain showers. 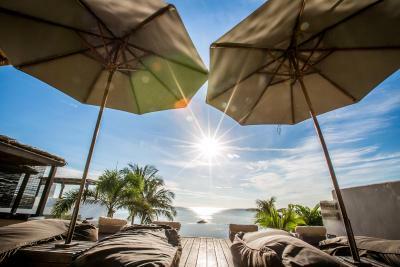 Guests can enjoy beautiful ocean views from Pranburi Aleenta’s infinity pool or indulge with relaxing treatments at the spa. Recreational activities include fishing, golf and horseback riding. 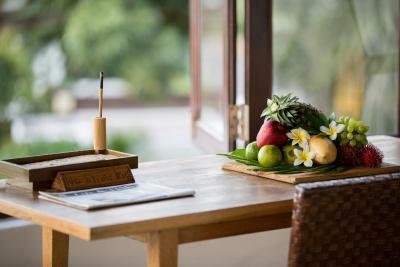 The staff at the 24-hour front desk can help with travel arrangements. 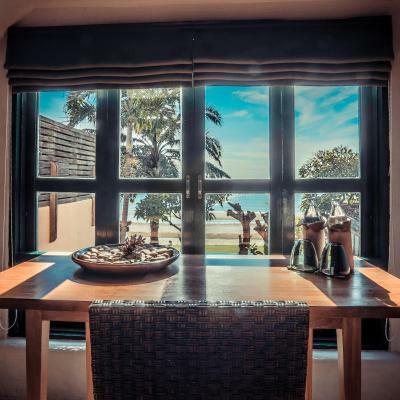 Cool sea breezes and panoramic views accompany gourmet dining at The Living Room Bar. 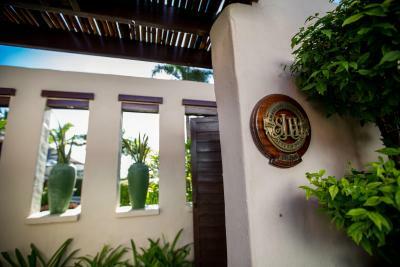 The restaurant features a variety of wines and dishes prepared from locally-grown organic vegetables. 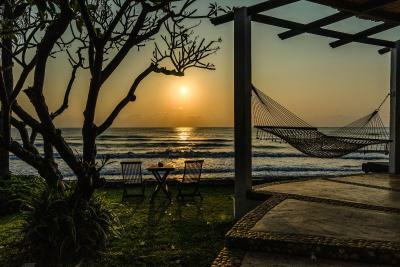 Aleenta Resort and Spa, Hua Hin - Pranburi is a 2.5 hour drive from Bangkok and a 30-minute drive from Hua Hin Airport. 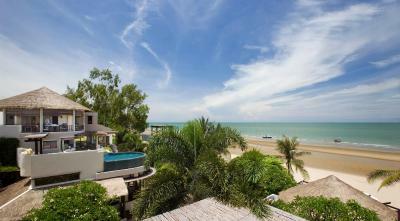 This property also has one of the top-rated locations in Pran Buri! Guests are happier about it compared to other properties in the area. 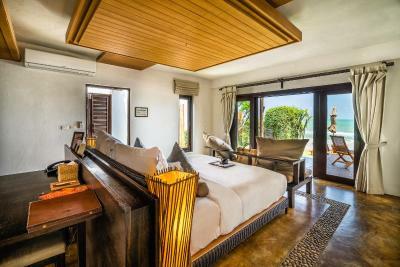 When would you like to stay at Aleenta Resort and Spa, Hua Hin - Pranburi? 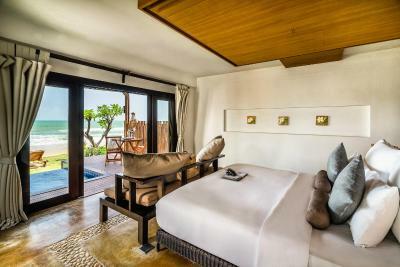 Steps from ocean, open-concept suites feature a private terrace with outdoor seating. Children aged below 12 years old are not allowed in this room type. 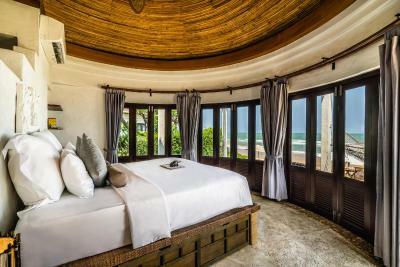 Beachfront suite features sweeping ocean views, private plunge pool and terrace, and en suite rain shower. 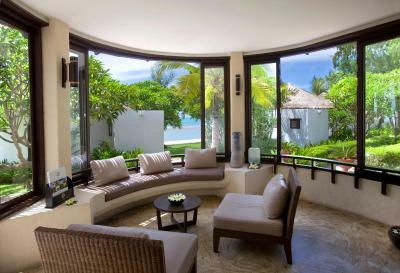 Each unique Frangipani Residence features large windows which open up to a private sundeck. 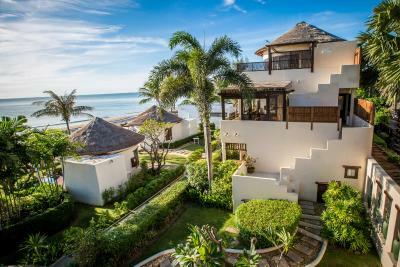 It offers sea views and overlooks the main resort pool. 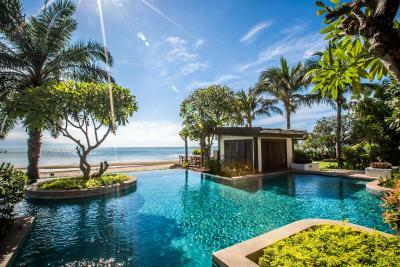 Offering views of Khao Sam Roi Yot National Park and stunning sea views, the spacious and circular-shaped residence offers a stone tub for two and a private sun terrace. 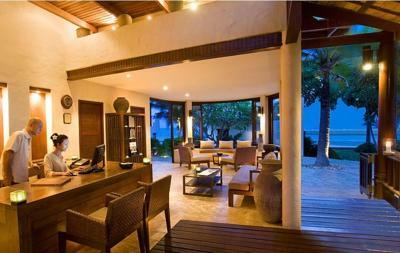 The villa comes with a living room, a dining area and mini-bar. 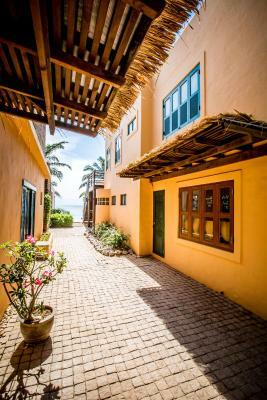 It also has a patio and a small lawn that leads to the beach. 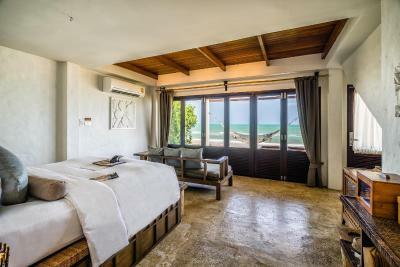 The master bedroom comes with stunning sea views while the 2nd bedroom is fitted with twin beds. 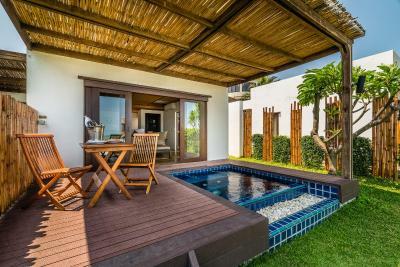 An outdoor pavilion with sun loungers and an outdoor dining area is also available. 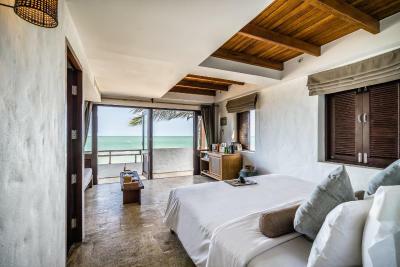 This 4-bedroom ocean-front villa features a living room, a dining room and a sundeck. 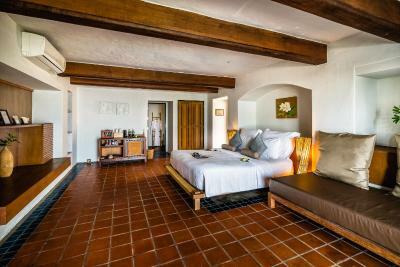 The spacious bedrooms all have an private bathroom. 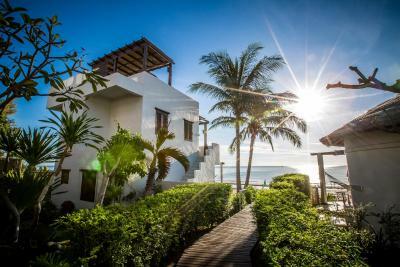 Outside, there is a 12x5 yard infinity pool overlooking the ocean with private beach access. 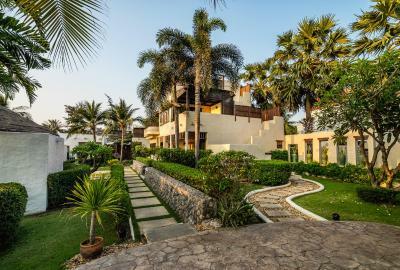 Located a 10-minute bicycle ride from the main building, the 3-bedroom villa comes with a 10-yard long private pool, garden views and a library. 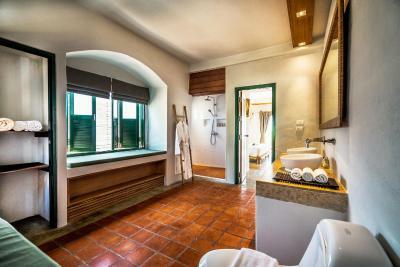 Fitted with a bath or shower, the villa comes with 4 bathrooms; 3 of them being en-suite. Guests can make use of the 6 bicycles provided. 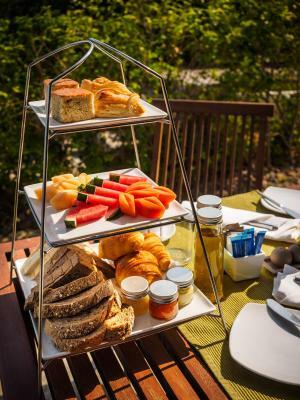 Pick-up services to the main resort for evening meals and breakfast is also available upon request. 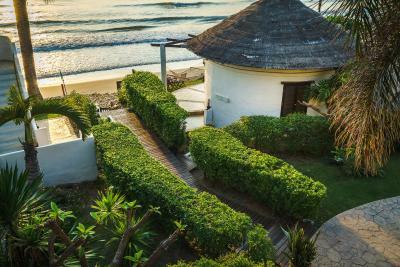 House Rules Aleenta Resort and Spa, Hua Hin - Pranburi takes special requests – add in the next step! All children under 12 years are charged THB 885 per night for extra beds. Any additional older children or adults are charged THB 1765 per night for extra beds. 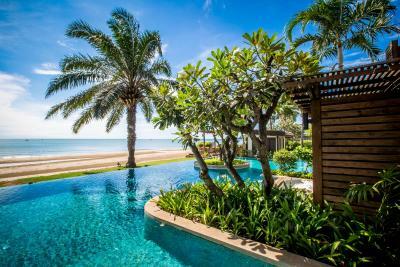 Aleenta Resort and Spa, Hua Hin - Pranburi accepts these cards and reserves the right to temporarily hold an amount prior to arrival. Please note that room rates on 31 Dec 2019 include a gala dinner. Extra guests will be charged separately. Children aged below 12 years old are not allowed to stay in Ocean View Residence, Pool Residence, Penthouse and Palm Pool Residence due to safety reasons. Please note that the property does not allow guests aged below 18 years to check in without a parent or guardian. Guests aged below 18 years who wish to check in alone are required to present a consent form signed by the parents to the hotel management team. We booked a Sea View Residence. The name residence is misleading as we received a room, the room was nice although there is quite a difference in the layout of these rooms. Staff was great although surprisingly they didn't find my sunglasses I forgot after checking out, I had them for a long time and was attached to them. 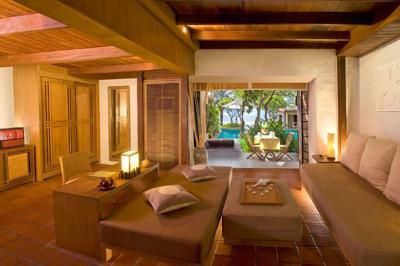 Nice boutique hotel, right by the beach. Staff is friendly and accomodating. If you want a beach holiday it is difficult to beat this. Breakfast is made to order and tasty. The food at the restaurant or room service is tasty too. We enjoyed our trip. We didn't *like* everything we LOVED everything. The staff were amazing, the food delicious, the SPA fabulous, the rooms gorgeous and the beach lovely. Not big deal but it needs some better preventive maintenance plan. We had the air conditioner and toilet not working properly but they were fixed the first day right after we reported them. We also found ants and termites next to the pool and a cockroach (only one though) in the shower room. The room is old and not very functional. Key card was not good. A/C was broken. At this price I expect more. The room is disappointing. A/C is broken. For this price I expect better facilities. Assist Manager very very rude, impolite and disrespectful! 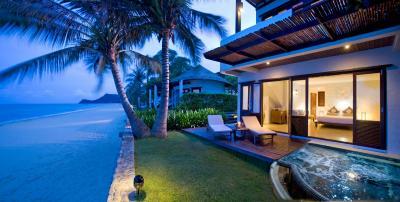 , The villa of resort show in the picture and the real villa is different place. The villa (3bed) that we stay is 4km. far away from Aleenta resort main building where name Pran- A-Luxe. Please be aware before booking. Recommend to stay at Villa Maroc which better services. The lady in front office are nice and helpful. The two things that irritated us somewhat was the cost of the food / drinks and the proximity to Hua Hun itself. The second one I can take on the chin as I should have researched a bit more on that.However, I do feel that the property may....may win if they lowred the price of drinks and food a tad.